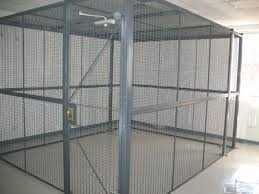 Wire partitions can create both wire storage cages and security cages. We have utilized wire partitions for a vast number of applications. CSI can handle your inventory security needs, your tool security needs, DEA product storage requirements, access security needs at entrances, equipment or product separation and security needs, and even prisoner security holding applications. Wire partitions can be configured in many ways to fulfill most all security and separation requirements. Wire storage cages and security cages can have one wall, two walls, three walls, or four walls, with or without ceilings, and with or without floors. Wire partitions can also be used for machine guarding and protective railings. CSI assists customers with their safety and security objectives with its wire storage cages and wire security cages.